Over the past couple years, more and more reduced and minimal shoes have hit running store shelves. Big shoe companies have expanded their line to include shoes with reduced profiles. (In my opinion, more variety is usually good, unless a company is axing an awesome shoe in favor of a less awesome shoe, because that's not variety, that's just obnoxious). Additionally, many new companies who solely offer minimalist shoes have entered the market. I may not be a minimalist, but I can appreciate a greater variety of shoes on the market, especially when some of those minimalist shoes are sweet and give me options to wear on days when I just want less shoe. One of the new companies specializing in minimal shoes is SKORA, who offers two models, the Base and the Form. Their premium model is the SKORA Form. FORM is definition of premium performance. Featuring a full-leather upper made of Pittards Goatskin leather with WR100X leather lining, FORM is designed with asymmetric lacing and no-tongue construction to provide a glove-like fit in combination with stitch-down construction and an Ortholite sockliner. A perfect balance of comfort, cushioning and control, FORM will take you further on any road, trail or running surface you throw at it with a Zero-drop, 9mm stack height platform engineered for excellent groundfeel. Be one with your run, in the definitive style-icon - FORM. FORM is built on the R01 platform composed of the REALFIT™ last, developed to offer a unique anatomical fit that closely matches the foot’s shape. The R01 platform also features a zero-drop outsole/midsole with minimal cushioning and a curved section profile in both the forefoot and heel. This allows for optimal natural movement and performance. Zero-Drop Zero-Drop means the heel on the same plane as the forefoot, which keeps your movement natural and biomechanically correct. Minimal Cushioning Minimal cushioning ensures better ground-feel and allows your foot and body to work together. Asymmetric Lacing Your foot is asymmetric, so is our lacing and strap systems. This provides a better, more comfortable fit. Stitch-Down Construction Eliminates extra seams and stitching inside the shoe for improved fit and comfort with or without the sockliner. Anatomical Last Asymmetric last shape with curved bottom profile, wider toe-box and larger ball girth volumes provides a more natural fit. Curved Outsole Forefoot Profile Mimics foot shape and encourages natural medial to lateral roll. Curved Outsole Heel Encourages natural heel movement (medial to lateral) in running and heel roll in walking. Concave Outsole Forefoot Fits natural foot shape and provides a more natural ground feel. No Heel Counter Lack of reinforcement allows for optimum fit and comfort in all degrees of motion. Elastic Heel Strap Enables personal fit and customization for maximum comfort and performance. SKORA Form has a Pittards goatskin upper and sheepskin lining. Like buttah. The most distinctive part of this shoe is the fact that it sports a Pittards Armor-Tan goatskin upper and a Pittards WR100x sheepskin lining. Unfortunately, this makes the shoe useless for vegans (the Base, which uses an elastic strap system instead of laces for closure, has a mesh upper, though I'm not sure whether or not that shoe is vegan because I have no idea what kind of dyes they use). However, for everyone else, this makes for an extremely luxurious feeling upper. They feel like an expensive pair of shoes (probably because they are...more on that later). The upper is smooth as butter sockless if you prefer to run sans socks. I do have some concern though, as I have not had the opportunity to wear these in warm weather, and I cannot tell you whether or not the leather will be breathable, since mesh is generally a more breathable material. There are plenty of ventilation holes in these, but it is still leather. While my eyes pick up seams inside the shoe upon visual inspection, I can't feel them for the life of me, so you may as well call it a functionally seamless construction and be done with it. The Form utilizes a burrito-like upper with asymmetrical lacing, similar to what's on the Brooks Green Silence, so there are no problems with tongue slippage. They do, however, have a roomy fit (as opposed to the more glove-like performance fit of flats), so I definitely won't be racing in these. They kind of feel like a really well-made leather pair of Nike Aqua Socks. The last appears to be somewhere between semi-curved and straight...SKORA makes a pretty big deal of calling it an anatomical last, so I guess that's how the average person's foot is shaped. 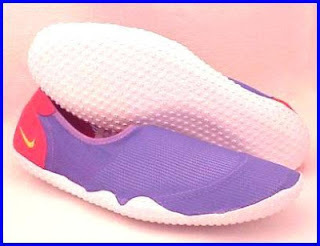 I found the forefoot plenty wide for toesplay, though I have heard some reports of people with wider feet who are used to some of the uber-wide minimalist shoes thinking they are narrow. Here's my take: they appear to be narrower than something like the New Balance MT10, but because the upper is made of leather (and there's no rubber band over the forefoot like on the MT10), they should stretch and conform to your foot as you wear them. As far as the rearfoot, for the first two runs I did in these, I noticed some heel-slippage, and was about to complain that the heel was too baggy. Then I realized there's actually a velcro strap around the back of the shoe you can use to customize the heel fit, which solved my heel-slippage problem. SKORA Form's last is somewhere between semi-curved and straight. The Form is crazy flexible. It doesn't matter which direction you want to flex these shoes, because they offer little resistance no matter how you bend them. They do have hard outsole rubber surrounding the flex grooves, so I guess it's possible that if your foot doesn't line up properly with the flex grooves, they may seem like they're flexing awkwardly, which is actually something I was concerned about when I realized my foot wanted to flex a part of the shoe that was covered in hard outsole rubber, but once I actually started moving in them, I realized they flexed so well around that point that I was fine. The cushioning in the Form is somewhere between "super firm" and "non-existent." With the insole, they have perhaps a touch more cushion than the MT10 and Mizuno Wave Universe. Maybe. Without the insole, they're probably the firmest shoe I've worn. 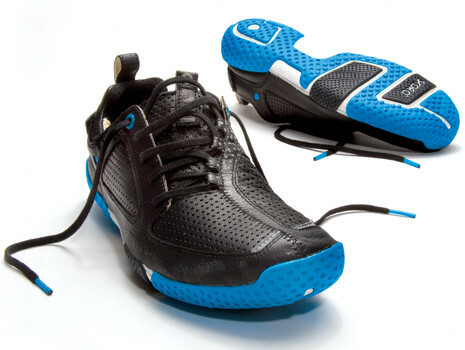 Thanks to the lack of cushioning and the high flexibility, the Form has quite a bit of groundfeel. I probably would not take these on trails, both because there's not much protection underfoot, and because the tread does not seem conducive to good trail traction. Asphalt, grass, and dirt roads yes, trails no. As you'd probably expect, there's plenty of response to these too. Speaking of the insole, the Form has a 4mm insole that can be removed if you want to take the cushioning down even further. Be warned that this does, obviously, also increase the volume of the shoe, so if you plan on taking out the insole, you may want to size down an additional half-size. Although if anyone has a very wide foot and thinks that the forefoot is too narrow, taking out the insole opens it up even more. I tend to prefer it with the insole, though some of you who prefer your cushioning as minimal as possible may prefer it without. Groundfeel is reduced a tiny bit with the insole, but it's still higher than most other shoes I've worn. Oddly enough, I ditch the insole when just walking around with them...kind of gives them a comfy bedroom slipper feel. Also, without the insole, you can kind of feel the little bubble of outsole rubber under the heel, but I mostly forgot about it once I started running in them. The Form pretty much lacks support completely. The upper is unstructured enough that there's practically no inherent support, there's no heel counter, and you're certainly not getting any support from the midsole. Um...I guess that's the point of a minimalist shoe though. It's pretty similar to the Wave Universe in terms of support, though the shoes do have a significantly different feel (and I wish I could write something more descriptive than "one feels like a racing flat and the other does not," but anyone who's worn flats and compared them to shoes that are built specifically as minimal shoes knows what I'm talking about). Since there's no cushioning to roll into, however much your foot pronates naturally will be it...no exaggerated overpronation here. Of course, if you do naturally overpronate, you'll likely find your foot "spinning" a bit on toe-off, since there's nothing to control your overpronation either. This review wouldn't be complete without mentioning the shoebox that gets everyone so excited. Indeed, it's a nice looking shoebox that closes with a magnet, and if I had received mine in one piece, I'd probably be using it to organize my stuff a little bit. Alas, mine did not come in one piece as all the glue had come apart, and one should not have to re-glue a shoebox that accompanied a pair of $185 shoes. If I were a three-year-old child who got more excited about cardboard boxes than their contents, this review would look very different. Luckily for SKORA (and for my page count, because a blog on shoeboxes would be pretty boring), I am not a three-year-old child who reviews boxes, and am instead a twenty-seven-year-old woman who reviews shoes. The biggest downside to these shoes is the price. Holy sticker shock, Batman! I'm sure goat leather isn't cheap, but $185 is a rough price to swallow for a shoe that's pretty uh...minimal (though you do have to keep in mind that while there's less material involved in producing each shoe, the R&D is likely similar to that of a traditional trainer, and, of course, the goat leather is pretty nice). With a price tag that's nearly twice that of many other shoes available, let's hope that the Form lasts twice as long. For a more reasonable price, SKORA also offers the Base, which has a mesh upper, velcro closure system, and is a touch lighter, but has the same midsole and outsole as the Form. The SKORA Form is a truly awesome and well-made minimal shoe. However, whether it's twice as good as other minimalist shoes to warrant a price tag twice as high...well, that's up to you. It's really hard for me to sit here and wholeheartedly recommend this shoe, because although they are really cool, they are also really expensive. Of course, the Base may be a cheaper alternative for those of you who are interested in SKORA, don't mind the Base's lack of laces, but don't want to pay the high entrance fee. I would be curious to hear from people who have been wearing these for a while, because if the stories of them still having plenty of life in them after 1000 miles are typical and not the exception, that would make them much easier for me to recommend. I do think that SKORA has an excellent entry in the minimalist market, particularly for experienced minimalists, as well as for barefoot runners looking for some protection from the elements this winter, and if SKORA is able to get production costs and MSRP down, they will have a winner on their hands. The SKORA Form retails for $185 and can be purchased on the SKORA website. It runs a bit large, and I had to size down a half size from my regular shoe size (and I'd probably size down a full size if I planned to wear these without the insole). SKORA does offer free return shipping in case you mess up your sizing. Full disclosure: The SKORA Form was provided free of charge in exchange for a review. The opinions expressed in this review are mine and based on my experience, and do not reflect the opinions of SKORA or anyone else. Thanks for the review Becki! I can get you another shoe box if you want ;) Actually, our supplier switched the glue (or maybe even the boxes) w/o informing us. Obviously we were not pleased, and the error has been taken care of. I've done multiple trail ultras in the Form and Base without any issue. The high density EVA does a better job at taking some impact from rocks than lower density material will, but it's obviously not as hard as a thicker shoe or one with a rock plate. I actually prefer thinner soles for trails to have better proprioception, rather than wear a thicker shoe with a rockplate. On the flip side, I like thicker shoes for my road running.